The Annadale Two Bay Hutch dresser is made from the highest grade of Rimu, a stunning piece. 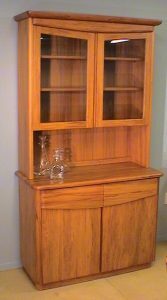 Variations of this hutch dresser can be custom made and doors and drawers can be made straight rather than curved if preferred. The back of the dresser can be made from either NZ Rimu tongue & grove or rimu veneer. Weekly offer: Base only $2990 . Base and hutch $4990.